2) Make sure you are running Canon firmware 1.0.4. - MZ is flickering. No solution known beside basically hardlocking the UI. (obsolete info) How do I test it? 6. Start camera in M photo mode and reset settings to default. 7. Extract the contents of the installation zip on SD card. 8. 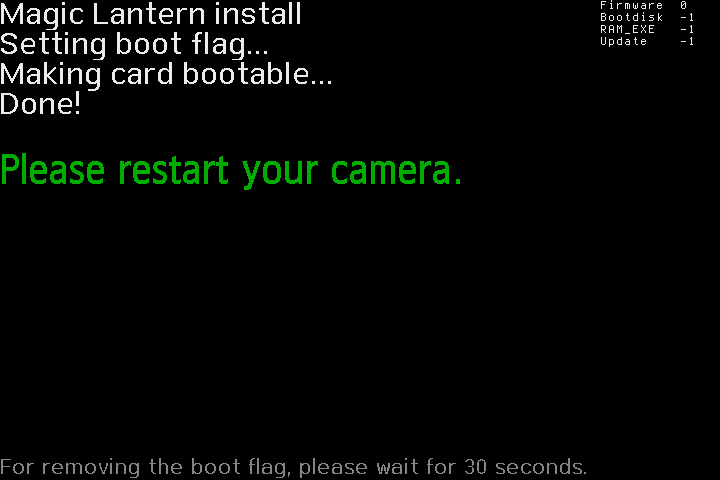 Start camera in M photo mode and run firmware update. THis will run the ML setup and make your card bootable too. I'm looking to do the upgrade, just wondering is bracketing on the update? все работает, жаль настроек звука нет. спасибо еще раз! everything works, sorry no sound settings. Thank you again! The process only works on my 16GB and 32GB cards. For my 64GB card I had to do different. This build has everything enabled. Nice!, I was still on 1.0.1 so didn't need to update but thought I'd test it anyway. this has the raw viewer module too which I didn't have before, so got a nice surprise! great work guys and thanks again! i did not understand this step, have we to replace all the folder ML and autoexec bin? cool what did you do differently to make the 64 gig work? Me olvide , es normal que en modo 1920x1080 grabe a 1920x1088 ? . Installed & Working. Thank you for all your hard work nanomad & Satriani! Thank u for porting to 1.0.4. Did a full day shoot on 27 July nightly build and am pleased to report no issues, where primary features were used... peaking, zebra, audio (no meters of course), 5x zoom were good. However fps was at 1.0x and magic zoom not used. One thing I did miss was the shortcut button to change WB. Using the ML menu to change WB was OK except that I can't change it while recording. Once again, very appreciative of your time & efforts. Does it mean we are close to the βeta now ? Thank's for this great job !!! When I use Motion Detect, how can I stop it ? I try several buttons but It always running, I'm obliged to turn off my camera !? Can I Stop ML and return to Canon Software ? For the moment I turn the camera OFF and ON to return on Canon Menu. For Motion Detect, I found this : After take a picture when the screen return to Motion Detect, just press trash button. If you turn your camera on and off ML will be loaded. If this worked for you until now there is no use changing the method. If however you turned the camera off and turned it on again with SET pressed ML was indeed deactivated. In simplified computer terms: ML is a task/program loaded at startup and waiting for action. If SET is pressed it will not be loaded and therefore not waiting for action. To access the ML interface you have to press the trash button and you can use the same button to go back to Canon's own interface. But after deleting the "650D.104.installer.fir" which fir. I have to use? Or we no longer need a fir. on the card? I am a bit confused. You no longer need the fir on there, that's just the firmware (.fir) updater and deleting it is probably so you don't accidentally do it again later. Many thanks nanomad for all your dvelopment work and to satriani for your daily builds, appreciate your efforts!